Fritz's Polka Band is truly proud to be a member of the Jagermeister Family. Just one of the many perks that Jager provides bands is the opportunity to check out the Jagermeister Music Tour (in a VIP way!) when it's in-action. On Friday, February 18, 2011, Fritz and Mike of Fritz's Polka Band and their friend Jon made the trip to Clifton Park to check out the Jagermeister Music Tour. It was held at Northern Lights and featured Buckcherry as the headliner. Fritz, Mike, and Jon had a blast meeting old friends from the "Jager Family" that evening, as well as making new friends. Fritz even ran into a former co-worker, Nicole, and her friend Elizabeth. Xavier Muriel (on drums) and Keith Nelson (on guitar) of Buckcherry rocking out on February 18, 2011 during the Jager Winter Tour in Clifton Park, NY. 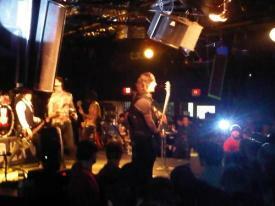 Buckcherry on-stage as the headliner during the Jager Winter Tour in Clifton Park, NY on February 18th. Fritz is pictured here with Elizabeth Pasqualina (left) and Nicole Van Hoesen at the Jager VIP Party during the Jager Winter Tour in Clifton Park on February 18th. 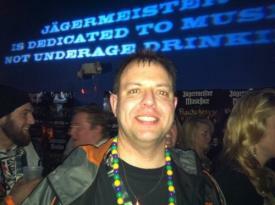 Fritz appears below a very important messate at the Jager VIP Party during the Jager Winter Tour on February 18th. 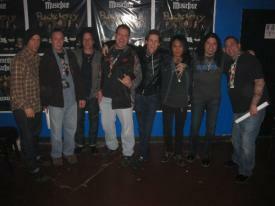 Fritz and Mike along with their friend, Jon Hluska meet Buckcherry in Clifton Park during the Jager Winter Tour on February 18, 2011. Fritz is pictured here with his pal, Erik Whittle at the Jager VIP Party on February 18, 2011 in Clifton Park, NY. Mike hams it up for the camera at the Jager VIP Party during the Jager Winter Tour on February 18, 2011. Fritz is pictured here with his friend (and former co-worker) Nicole Van Hoesen during the Jager Winter Tour on February 18th in Clifton Park, NY. Mike lends his support here to the Jager text promotion on February 18, 2011 in Clifton Park, NY. Mike and Fritz are pictured here with Sarah Whittle at the Jager VIP Party on February 18th during the Jager Winter Tour in Clifton Park, NY. 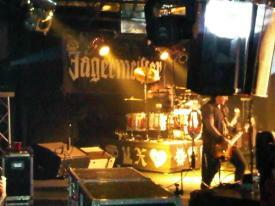 Fritz lends his support here to the Jager text promotion by the Jagerettes on February 18th in Clifton Park, NY. Mike and Fritz are pictured here with their friend, Jon Hluska having a Jager toast at the Jager VIP Party during the Jager Winter Tour on February 18th in Clifton Park, NY.